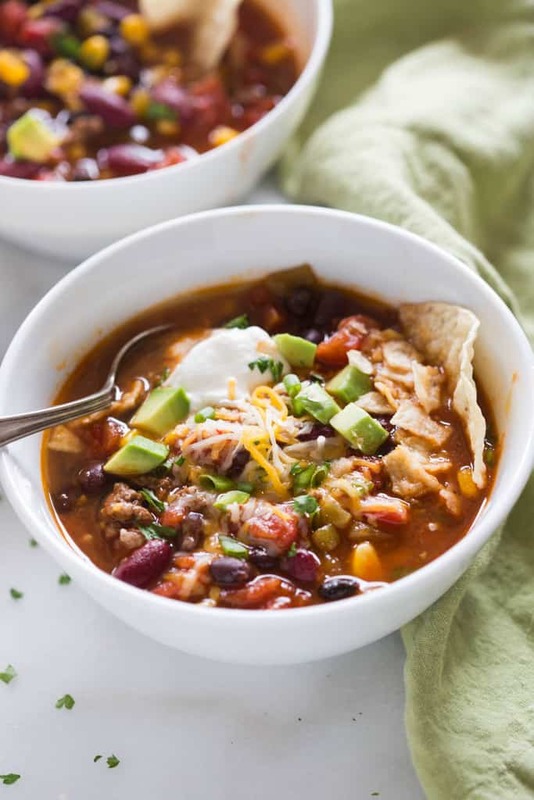 Kelly, RD November 15, 2018 avocado dinner ideas family meals healthy recipes registered dietitian slow-cooker meals Vegetarian meal6 Comments on Why Have I Never Given You This Recipe? Taco soup. It’s a go-to. Perfect for taco Tuesday when you are totally over taco Tuesday. It’s super easy and all ingredients can be thrown into a slow-cooker in the morning. You will come home to an aroma that will make your belly instantly growl and the whole family will love you for making it! Guess what? It’s healthy! You can add meat if you want but, you don’t need it and you will be so proud of yourself for saving all those calories and fat grams by leaving it out. Packed with vegetable protein and fiber from beans, you won’t miss it! Plus, you won’t feel guilty topping off your bowl with a dollop of sour cream! Perfect for Taco Tuesday, this recipe is vegetarian, low in fat and extraordinary! Throw all the ingredients in the crockpot and have fun with the toppings! Brown onion in a skillet until translucent. Combine onion with all ingredients above, excluding optional toppings into a slow-cooker. Cook on high for 4 hours or low for 8-10 hours. If you don’t already have one of these, go ahead and get one. No one leaves the house for work and arrives home 8 hours later and you don’t want to make anyone sick from food that has been sitting in the temperature danger zone. You’re going to thank me for this one! The recipe and the crockpot, actually. Thanks Kathryn! I hope you try it! You can always tweak it to your liking! Add a diced jalapeño or your favorite bean. I love to dump tons of fresh cilantro and even more fresh avocado! Thanks for the comment!!! Thanks! It really is delicious! I’m a sucker for avocado and want a bit with every bite! It’s so easy too and a hit with all my kids! So the taco and ranch seasoning work together? Sounds good for this cold weaher! It works so well together! You can always make your own seasonings. I have a big jar of taco seasoning I made for dishes like these. I love soups and stews and hearty pasta dishes this time of year!